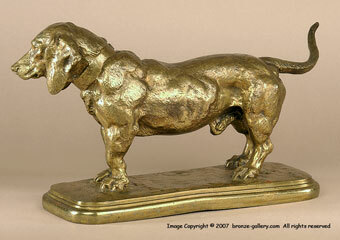 Barye's Standing Basset was first modeled in 1841 and it was offered in 5 different versions. This one has the head turned to the right and it is a pendant to the Standing Basset with the head turned to the left. The Standing Basset was cast in small numbers in Barye's lifetime. 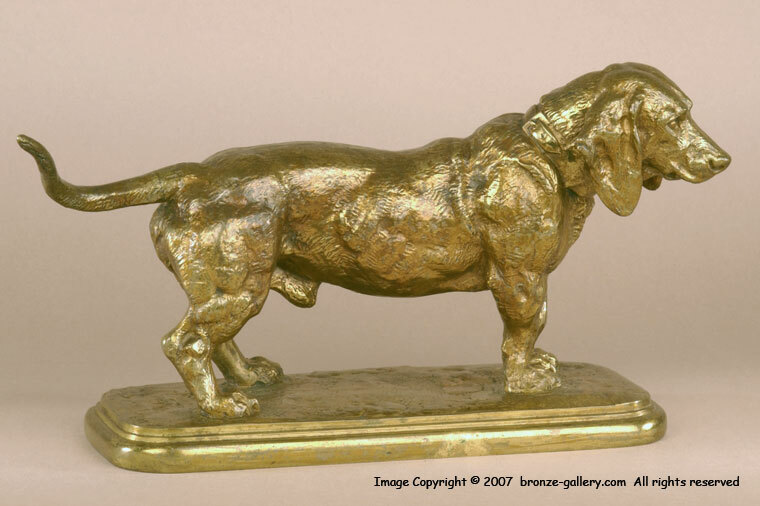 This bronze Basset is finished in a dull gilt patina and is well cast by the 19th century foundry Graux-Marly, it is marked GM and signed BARYE. The powerful dog stands on the flat base and has a stately dignity to him, making this one of the best and most classic Barye sculptures. A cast of this model is illustrated in Payne's book Animals in Bronze on page 221.